The Krugerrand is South Africa’s flagship coin. As the first ever gold commemorative coin, created in 1967, the Krugerrand is still the most widely traded bullion coin in the world. 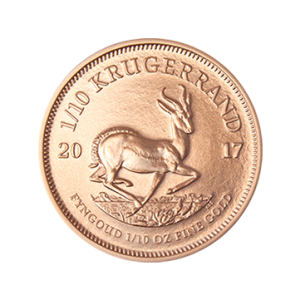 Manufactured in traditional rose gold (22ct), the classic design of the Krugerrand reflect South Africa’s historical and natural heritage. South Africa’s national animal, the Springbok is depicted on the reverse of the coin, while the relief effigy of Paul Kruger is portrayed on the obverse. 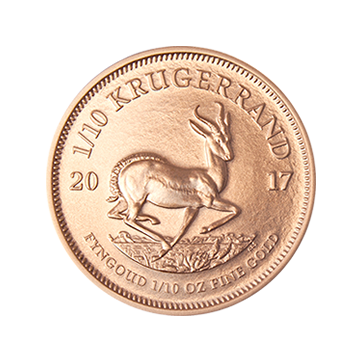 To purchase 1/10 oz Krugerrand’s, please call us on 011 784 4071 or complete the quotation request form below. ISA Gold is situated in the Office Towers at Sandton City, one of Africa’s leading and most prestigious shopping centres.